Elsie Carlisle, no later than 1933. A drawing based on this photo appears in Melody Maker at the end of 1933. From the collection of Terry Brown. Elsie Carlisle, mid-1930s. From the collection of Terry Brown. Elsie Carlisle c. 1936. The dress and hairstyle are identical to those in the photo of Elsie on the sheet music to “Up the Wooden Hill to Bedfordshire” (1936). From the collection of Terry Brown. Elsie Carlisle, probably from the same photo shoot. This photo appears in the February 8, 1936 issue of Melody Maker. From the collection of Terry Brown. 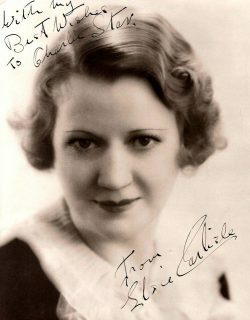 An autographed publicity photo of Elsie Carlisle addressed to Charles “Nat” Star. From the collection of Terry Brown. "The Idol of the Radio." British dance band singer of the 1920s, 1930s, and 1940s.